The Japanese stock market has seen the longest winning streak since 1988. Big Japanese manufacturers are the most upbeat they've been in a decade. And Japan's economy has seen the sixth straight quarter of growth - again, the longest in a decade. No wonder then that Japanese Prime Minister Shinzo Abe appears to be feeling pretty confident about his chances of victory at this weekend's elections. 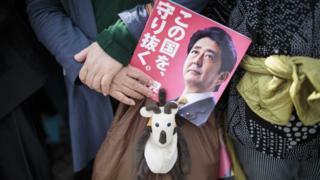 But how much of the economy's feel good factors are down to his Abenomics policies? The self-named Abenomics programme is the set of policies that Mr Abe came up with when he came into power in 2012. Monetary policy: Japan's hyper-easy monetary policy in the form of negative short term interest rates was put in place to make it cheaper for consumers and companies to borrow money and spend. Fiscal stimulus: Pumping money into the economy, which means the government spending more money on things like infrastructure, or giving financial incentives to companies like tax breaks. Structural reforms: Corporate reform, adding more women into the workforce, labour liberalisation, and allowing more migrants into the workforce to help ease labour pressures and add to economic growth. But the pledges Mr Abe made in 2012 haven't come to pass. While Japan's economy has done well in recent months, it hasn't hit the targets Mr Abe set back then. And while most Japanese feel better about their country's current economic situation than they did a year ago, according to a recent survey from the Pew Research Centre, concerns about the future - especially amongst the youth and middle-aged professionals - are still a big issue. That's because so far the success of Abenomics has been mixed - at best. Mr Abe can be credited for pushing through the first two "arrows" of Abenomics aggressively. But the third arrow of structural reform - and arguably the most important - has been sorely lacking, and Abenomics doesn't work all that well without all three arrows working together. Sure, Mr Abe can tout the fact that unemployment levels are at near four decade lows but salaries still aren't moving that much higher. Wages of full time workers rose an average of 0.7% in August and haven't budged much over the last four years. It is a vicious circle: although companies are doing better it is mainly because Japanese exporters are selling well overseas, rather than into the domestic market. That is because they don't think people will buy their goods, which means they don't make great profits at home, which means they don't raise wages, which means people feel less confident to spend money - and so the cycle goes on and on. This doesn't bode too well for one of the central goals of Abenomics - to push consumer prices higher, and to get inflation levels to 2%. Current levels are far lower than that. And Mr Abe shouldn't get too complacent about economic growth either. Growth will slow to 1% in 2019 from 1.7% this year, according to Capital Economics. The International Monetary Fund is even more pessimistic - forecasting growth of 0.7% next year. IF Mr Abe's party wins on Sunday, as some polls suggest, it won't be thanks to an Abenomics bump. Tough talk on North Korea, and the fact that Mr Abe represents a modicum of stability in Japanese politics, after years of the country seeing revolving door leaders, are all things that are helping him. But if Mr Abe gets a new mandate, the Prime Minister will have a lot of unfinished business to attend to. In order to keep the economy growing he wants to increase the national sales tax - but that could put more pressure on households, and curb consumption at a time when he wants prices to go up, not down. Mr Abe could start with making good on his promises to reform the structure of the Japanese economy, cutting red tape, liberalising the labour market and making it easier for foreigners to invest in Japan. Otherwise, without structural reforms, Mr Abe may well just be setting himself up for another political battle - and next time he may not be so lucky. Video Why is a Japanese firm apologising for upping prices?